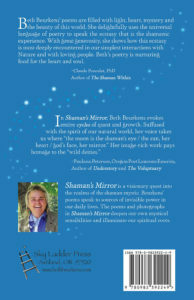 Shaman’s Mirror is a visionary quest into the realms of the shaman-mystic. Beurkens’ poems show us how to access sources of invisible power in our daily lives. The poems and photographs in Shaman’s Mirror deepen our own mystical sensibilities and help us illuminate our spiritual roots. 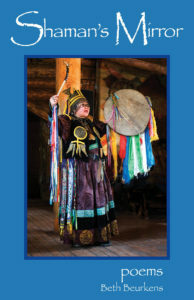 Ten spirit-filled color photographs of traditional shamans in their ceremonial costumes, root the poems in Shaman’s Mirror. The world class photographers include Carolyn Drake, Wolfgang Kaehler, Alexander Nikolsky, Paul Eijkemans, and Kevin Turner.